We have had numerous changes within the last two months. Our family grew from 3 to 5 quickly. We welcomed, Sullivan, on 3/5. He was 8lbs 7oz, 20 inches long. Sullivan was quite a bit bigger than Chamberlain Chamberlain is so in love with Sullivan. He really enjoys watching him and giving kisses. These two are going to be quite the pair as they grow up together. We also welcomed, Isamara, to our home. We call her Isa, sounds like Eza. She is an au pair from Brazil. Chamberlain just adores her. She is incredible with both kids. She plays and plays and plays with Chamberlain and Sullivan loves the snuggles. She wants to improve her English skills while in the US, to have better job opportunities when she returns. Chamberlain recently got glasses. 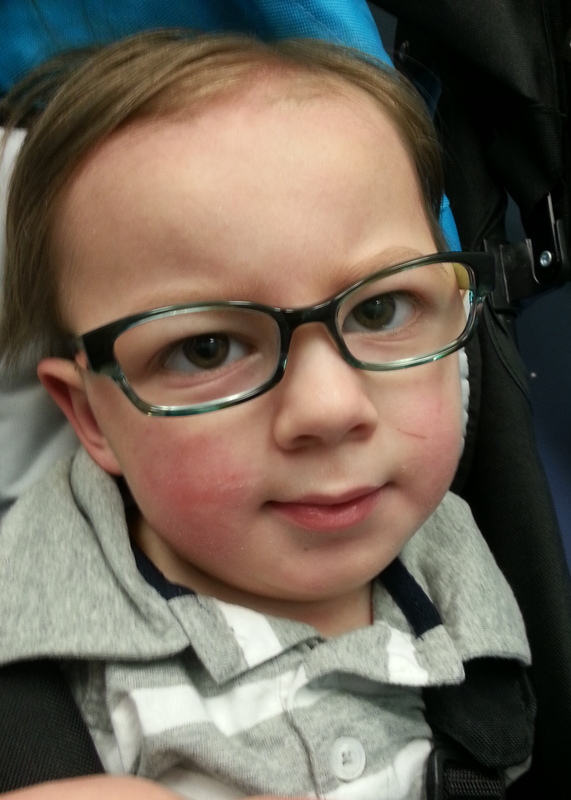 We thought he was the cutest before, but now… We are hoping these glasses will give him the best vision possible. It has been super busy, we have been going going going. Lots of follow up appointments this month, well actually all of our follow up appointment fell in this month. I will be avoiding that the next time. Way too much for all of us. Chamberlain is gaining too much weight now on his new diet. We had to make adjustments. Sadly the seizures are not controlled yet, but hoping these adjustments will help. We are embarking on transitioning into the school district from our Early Intervention Program. This has been quite a learning for Jeff and I, and we aren’t even halfway through the process. We will continue to advocate for Chamberlain to get him what he needs.